We’d love your help. Let us know what’s wrong with this preview of Tides of Darkness by Aaron Rosenberg. To ask other readers questions about Tides of Darkness, please sign up. World of Warcraft: Tides of Darkness is a fantasy novel written by Aaron S. Rosenberg and published by Simon & Schuster Pocket Star Books, a division of Viacom. The novel is based on Blizzard Entertainment's Warcraft universe, and is a novelization of the RTS PC game: Warcraft II: Tides of Darkness (1995). It was made available on August 28, 2007 . The novel explores the events of the Second War (which took place during Warcraft II) when the Orcish Horde, led by Warchief Orgrim Doomhammer, returns to Azeroth to destroy the Human nations. The book writer Aaron S. Rosenberg commented at a public Q&A that among the main characters are Khadgar, Turalyon, Lothar, the sisters Windrunner (Alleria, Sylvanas and Vereesa), Orgrim Doomhammer, Zul'jin and Gul'dan. Places featured are Hillsbrad, Stromgarde, Blackrock Spire, Caer Darrow, Stratholme and Quel'Thalas among others. The grand city of Stormwind has fallen. The dark tide of orcs sweeps over the lands of Azeroth, while the survivors of the war flee across the sea to seek aid in Lordaeron. But change is being made among the orcs. The Warchief of the Horde, Blackhand the Destroyer, has been betrayed and killed by his second-in-command; Gul'dan and the Shadow Council have been taken completely by surprise. And the Horde marches on under the command of its new Warchief... Orgrim Doomhammer. This book explains a lot. From what I've heard, it's apparently mostly a novelisation of the game Warcraft II, and it definitely filled in a lot of holes for me. From the viewpoint of Anduin Lothar, Tides of Darkness tells the tale of the Second War and the formation of the Alliance. Characters I had heard mention of but never encountered are introduced here, like Turalyon and Alleria Windrunner. And while reading, you also get to witness the origins of both the paladins and the death knights, among other things. The most interesting part is that Orgrim Doomhammer, one of my favourite Warcraft characters and an overall pretty nice guy, is the main antagonist. And the word antivillain immediately comes to mind. Imagine Ned Stark as a bloodthirsty orc, and you have Orgrim. Honourable, traditional and respectful. And unfortunately also a guy who's main goal is to raze your homeland to the ground. The first half of the book was unfortunately boring as hell. The second half was surprisingly good. Like the other books in the series, it's poorly written and remarkably shallow, but it does the job of presenting more of the backstory rather skillfully. This review has been hidden because it contains spoilers. To view it, click here. I have mixed feelings about Tides of Darkness . It had the potential to be the best book of the series (out of 3, as I read them in chronological order), but unfortunately it turned out to be far from flawless. The best thing about this novel is that it shows us how the races of Warcraft started to form the Alliance and the Horde as we know them now. We see how the orcs and the trolls start to work together, Gul'Dan brings us the first set of death knights, and on the other side Rosenberg tells I have mixed feelings about Tides of Darkness . It had the potential to be the best book of the series (out of 3, as I read them in chronological order), but unfortunately it turned out to be far from flawless. The best thing about this novel is that it shows us how the races of Warcraft started to form the Alliance and the Horde as we know them now. We see how the orcs and the trolls start to work together, Gul'Dan brings us the first set of death knights, and on the other side Rosenberg tells us how the elves and the dwarves became members of the Alliance. As these two groups are growing in numbers, and the confrontation between them become inevitable, we get to see some great battles, which is nice for sure, but unfortunately these battle scenes have some flaws. I understand that it makes a fight more exciting when a new element is added to the mix that changes the tides of battle, but if this happens too often in a short period of time, it becomes somewhat lame. Like the battle of Quel'Thalas. At first the Horde is winning, then the elves and the Alliance unite their forces and they are winning, then the the two-headed ogres show up, and the Horde is winning again, then the dwarves arrive on the back of the gryphons, guess what, the Alliance is winning, but then come the dragons and they finally win the battle for the Horde. In my opinion it's not very good writing, especially when something similar happen later on again, on the seas but that time the gryphons triumphing over the dragons. Another thing that bothered me was how Rosenberg managed the question of messaging between forces. Sometimes they message each other sometimes they don't, and I don't really understand what's the difference between these two type of situations. Just an example: When Lothar realized that the Horde was on its way to Quel'Thalas why didn't he send a messenger to the elves? Either a bird, or a gryphon. I know the surprise factor is bigger this way, but the lack of logic undermines the credibility of the story. And last, but not least I have to mention one more thing I have mixed feelings about. I really liked the duality in writing. I mean it was really nice to view the events from the view of both sides, but my problem with that was when it came to the great battles between the two factions, Rosenberg always showed them from the view of the Alliance. Of course it's his choice, but as this novel is based on World of Warcraft where the Horde and the Alliance are both playable factions and both have many "fans" all around the world, I think it's an unfortunate decision to show all the battles from the view of one side. I'm pretty sure that there are some/many Horde players out there that felt offended by that. I wouldn't have problem with that if the whole book was written that way. Ok, so I mentioned mostly negative things, but it doesn't mean I didn't like this book. It only means that I'm a bit sad because it could have been an awesome Warcraft-related book, but instead of that it was only decent. Gotta say that I quite enjoyed the book overall. The escapades of the early Horde and the early Alliance provide some of the lore-defining details that are background to World of Warcraft. Orgrim Doomhammer is an interesting antagonist, not quite a good guy, per se, but not an evil savage by any means. His code of honour when coupled by his plan of hostile invasion and complete disregard for the lives of his enemies made him a more complicated villain than you usually get within the Warcraft uni Gotta say that I quite enjoyed the book overall. The escapades of the early Horde and the early Alliance provide some of the lore-defining details that are background to World of Warcraft. Orgrim Doomhammer is an interesting antagonist, not quite a good guy, per se, but not an evil savage by any means. His code of honour when coupled by his plan of hostile invasion and complete disregard for the lives of his enemies made him a more complicated villain than you usually get within the Warcraft universe. Orcish Warlock Gul'dan fits into the more distinctly evil category, though his final fate in this book (perhaps dictated by pre-established lore?) is a bit abrupt and feels like an appendage to the general story. I wouldn't go so far as to say the heroic characters are less defined, but they are certainly a little less engaging. We do get some interesting first glimpses of characters who will later take a bigger role in Warcraft lore, such as a younger Lothemar Theron and a pre-banshee Queen Sylvannas. I read this immediately after finishing "Rise of the Horde," by Christie Golden, and as such it provides a continuation of what happens after the orcs entered the Dark Portal. It is the story of the Second War, when the orcs tried to take over Azeroth but were stopped by the Alliance of humans, dwarves, and elves. "Tides of Darkness" is a novelization of Warcraft II, and so is good background information for players new to the Warcraft universe. I don't have much to say about this book. It's a quick read, despite its length of 374 pages; it felt to me like Rosenberg was writing to a juvenile audience. While he has some key figures of the Warcraft universe starring in the book, such as Turalyon, Khadgar, Lothar, Doomhammer, Gul'dan, and Zul'jin, the novel as a whole feels pretty flat and uninspired. Part of that could be because it is a direct tie-in novel to a video game and the author likely didn't have much leeway, but I still wish the book just had that special something to it. Je ne sais quoi. The epic battle between the blood-thirsty orcs and the lion-hearted humans has been beautifully depicted in this book. Action packed, this book provides entertainment, even more so if you are a WoW player. The lore is also abundant in this book and explains several things found in the game. It also links the previous books, including the Warcraft novels. All in all, it is well written, eloquent and is truthful to the game version of the characters described, as well as the places and landscapes The epic battle between the blood-thirsty orcs and the lion-hearted humans has been beautifully depicted in this book. Action packed, this book provides entertainment, even more so if you are a WoW player. The lore is also abundant in this book and explains several things found in the game. It also links the previous books, including the Warcraft novels. Wow. I just finished this book and I'm in shock I have to admit the first half was a bit slow but then it all comes together in a powerball. Rosenberg's masterful storytelling brought me to the edge of my seat many times, and at the end...it also brought tears to my eyes. Great writing, pace, character development and ending. I'm just wowed and I can't wait to read more from Rosenberg. This book also did a really good job in explaining some lore, characters and connections that are missing. 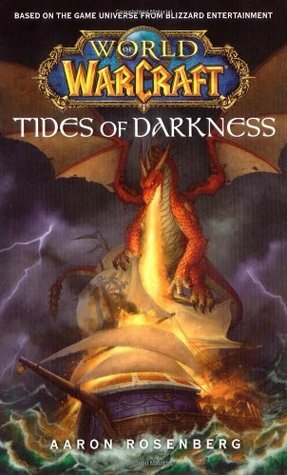 I found Tides of Darkness to be a gripping, well-rounded book. The plot doesn't follow the sort of traditional format where all the fun stuff happens in the last third of the book, which only adds to the enjoyment. World of Warcraft players might want to keep in mind, however, that Tides of Darkness was written in a time before the current map of the Warcraft universe was established, so some of the locations are slightly out of place. Rosenberg's battle scenes are probably the beast part about T I found Tides of Darkness to be a gripping, well-rounded book. The plot doesn't follow the sort of traditional format where all the fun stuff happens in the last third of the book, which only adds to the enjoyment. World of Warcraft players might want to keep in mind, however, that Tides of Darkness was written in a time before the current map of the Warcraft universe was established, so some of the locations are slightly out of place. Rosenberg's battle scenes are probably the beast part about Tides of Darkness. The author finds a good balance between inner dialogue and actual fighting, and his characters are surprisingly complex for the time and audience for which it was written. That's not to say the rest of the book is dull; aside from a slight tendency on the author's part to overdose on -ly adverbs at the wrong time, most of the scenes are enjoyable, and the multiple story threads are easy to follow despite the large number of characters involved. His dialogue flows (unlike other Warcraft books that tend to get unnecessarily hammy at times), and his characterization works without going over the top. My one gripe with this book was one that was rectified in later works, and that is the very conspicuous absence of Durotan, who gets only a passing mention towards the end of the story as having been found and killed by the Shadow Council's assassins. While we do get to see Durotan's actual fate in later books (Thrall: Twilight of the Aspects, Lord of the Clans, and also Warcraft: Legends, if memory serves), I still feel that Doomhammer might have welcomed his former friend back into the Horde once he deposed Blackhand and Gul'dan's influence shrunk. Oh well. In my attempt to familiarize myself better with the Warcraft lore, I picked Tides of Darkness up. In terms of chronological order, this is one of the first books that you want to be reading, right after the events at Karazhan and the unveil of Sargeras' scheme through Medigh. The book picks up right after the Horder enters Azeroth and is focused around their efforts to take over the known world to them. Some of the noteworthy characters that make their 'debut'(or have their spotlight moments) in In my attempt to familiarize myself better with the Warcraft lore, I picked Tides of Darkness up. In terms of chronological order, this is one of the first books that you want to be reading, right after the events at Karazhan and the unveil of Sargeras' scheme through Medigh. The book picks up right after the Horder enters Azeroth and is focused around their efforts to take over the known world to them. Some of the noteworthy characters that make their 'debut'(or have their spotlight moments) in this one include Turalyon, Luthar, Uther, Kudran, Alleria and Terenas. After the events in Draenor and the Horde's corruption, Doomhammer climbed to the top of the food chain and became the Warchief of the Horde. Given the preceded events, he wants to re-establish the honor of his kin and discard the taint of the ways that Gul'dan instilled upon them. On the blue corner, Luthar along with Turalyon and Khadgar jump start what is later known as the Alliance and try to drive back the Horde from whence they came from. There are a lot of battles in this one as well. I was really pleased by how the author described them and how I was able to visualize them at times, really vividly in fact. A small warning to Horde fans; you may want to skip this book if you genuinely dislike Alliance books. If you like to read fantasy books objectively though then I think that you will like this book and the kind of spectrum it provides on the initial state of the Horde. I'm thinking this book may be what most people play the game for. Lots and lots of fighting and descriptions of fighting. Not my cup of tea at all. I'm in it for the characters. Turalyon and Alleria delivered for me. I loved how real everything was through them. Even though they were about to fight for their very lives, they still had a strange attraction going on. And that really is how life is, regardless of what is going on, our "human-ness" still creeps in. I really enjoyed Turalyon's struggl I'm thinking this book may be what most people play the game for. Lots and lots of fighting and descriptions of fighting. Not my cup of tea at all. I'm in it for the characters. Turalyon and Alleria delivered for me. I loved how real everything was through them. Even though they were about to fight for their very lives, they still had a strange attraction going on. And that really is how life is, regardless of what is going on, our "human-ness" still creeps in. I really enjoyed Turalyon's struggle to be second in command and renew his faith in the light. Tides of Darkness for me was an interesting read because I've played World of Warcraft for so long it was easy to vision the places and some of the people in the book. I have not paid much attention to a lot of the lore in the game (I know the top level stuff) so getting deeper into the history of Warcraft and seeing certain things like the development of the Alliance and the first sittings of the Horde develop in the book were fun. 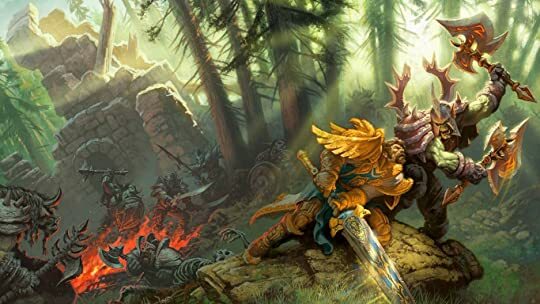 Some have said the beginning was slow but I enjoyed the back and Tides of Darkness for me was an interesting read because I've played World of Warcraft for so long it was easy to vision the places and some of the people in the book. I have not paid much attention to a lot of the lore in the game (I know the top level stuff) so getting deeper into the history of Warcraft and seeing certain things like the development of the Alliance and the first sittings of the Horde develop in the book were fun. Some have said the beginning was slow but I enjoyed the back and forth chapters between the Horde and Alliance and the faster pace of that story early on. The mid portion slowed for me a bit as it focused more on the battles, but the book gets exciting as it draws to a close. Tides of Darkness is a straight-up Warcraft II novelization, the sort of thing that you probably could have found on Fanfiction.net back in the day with 500 reviews and tons of people requesting more chapters about Ogrim Doomhammer in the comments section. As you might have guessed with a description like that, the writing is kinda shoddy. But if you were one of those Warcraft fans who clicked on your little orc peons a billion times until they stopped saying "Zug Zug!" and started yelling "Stop Tides of Darkness is a straight-up Warcraft II novelization, the sort of thing that you probably could have found on Fanfiction.net back in the day with 500 reviews and tons of people requesting more chapters about Ogrim Doomhammer in the comments section. In a story describing the continent-spanning war between The Horde and The Alliance featuring combatants from several different races from two different worlds, there are a grand total of only three female characters in this whole book - the Windrunner sisters. Of those three, two have only a single brief appearance and the third exists only as a half-hearted love interest for a male protagonist. All three characters disappear without explanation as the story approaches its climax. Frustrating as In a story describing the continent-spanning war between The Horde and The Alliance featuring combatants from several different races from two different worlds, there are a grand total of only three female characters in this whole book - the Windrunner sisters. Of those three, two have only a single brief appearance and the third exists only as a half-hearted love interest for a male protagonist. All three characters disappear without explanation as the story approaches its climax. Awesome book of the big war of orcs and humans. Good to tell the story of Ogrim Doomhammer and Anduin Lothar. It tells and early story of the global history of warcraft, mainly how the hatred for the orcs started in the high elven society, the first conflicts of the human kingdoms of the north (lordaeron, gilneas, and so on). There are also important parts regarding Gul'Dan and its twisted plans. For any warcraft fan it's a must read. Nevertheless I would council to start reading warcraft novels i Awesome book of the big war of orcs and humans. Good to tell the story of Ogrim Doomhammer and Anduin Lothar. The book is great, nice story overall. My only disappointment is concerning Doomhammer, I always saw him as a mighty orc, but the way Gul'dan plays him as fool is quite embarassing. For the Horde fans, I was looking forward to see the destruction of Capital City. Another thing I missed was Perenolde's treachery, the book took little concern on the subject... but as I wrote before, the book is great. The overall story is decent and the characters are quite likable. The storytelling is very poor however. I don't know if it is because it is an adaptation of the game or just the way it was written, but every battle is extremely abrupt. No matter what side is winning, something amazing suddenly happens that turns the tide and the battle is over. Also, the romance between Alleria and Turalyon was completely pointless and out of place. ჰორდის და ალიანსის პირველი ომის აღწერა. ყველაზე მაგარი წიგნია ომზე და ბრძოლებზე რაც წამიკითხავს, დინამიური, დაბალანსებული, ეპიკური. მთავარი გმირების, რასების და მათი წინამძღოლების ხასიათი და თვისებები, საუბრის მანერა, ყველაფერი უფრო ნაცნობი და მშობლიურია WoW-ის მოთამაშეებისთვის. და წიგნი ათმაგად საინტერესო ხდება. “What is he like?" asked Khadgar, his voice almost pleading. "Like everyone else, I suppose." said Moroes. "Has his druthers. Has his moods. Good days and bad. Like everybody else." "puts his pants on one leg at a time," said Khadgar, sighing.